Nancy Drew: Curse of Blackmoor Manor has very challenging puzzles and is a little scarier than most of the other titles in the series, making it a good fit for teens ages 13 and older. Nancy arrives at Blackmoor Manor to visit Linda, the daughter of her next-door neighbors. Linda has recently married Hugh Penvellyn, a British diplomat, but has withdrawn into her room and won’t let herself be seen by visitors. Nancy talks to her through a curtain and discovers that Linda believes herself to be cursed. The player becomes Nancy as she explores the spooky and graphically rich environment of Blackmoor Manor. Residing in the manor with Nancy and Linda are Mrs. Drake—the crotchety old aunt of Hugh Penvellyn, Jane—Hugh’s 12- year-old daughter from a previous marriage, Nigel Mookerjee—a writer working on the history of the Penvellyns, Ethel Bosinny—Jane’s tutor who is descended from a long line of tutors to the Penvellyns, and Lou-Lou—a 80-year-old talking parrot. As Nancy explores the mansion and talks to its inhabitants, she hears rumors of treasure hidden in the manor and of a dark creature with red eyes that roams the moor at night. Nancy also observes a weird ritual involving two members of the Penvellyn household. The more Nancy snoops, the more she finds including secret passageways, mysterious puzzles, messages from ancestors long dead, weird books, and even a rotating room. During the over 25 hours sleuthing, players will encounter a large number of intriguing and challenging puzzles. A few are timed. Some testers didn’t like the pressure these timed puzzles created, nor did they like the repetition that is required to beat the puzzle. Repetition is also prevalent in the player’s dealing with 12-year-old Jane, who will only help you after you have beaten her at her favorite logic games. Players frequently need Jane’s help, so they must play the games repeatedly. If you like logic puzzles, this is not a chore. Since Nancy never leaves the manor, this title feels a little more insular than some of the other Nancy Drew software. Your character spends a lot of time in dark passageways. 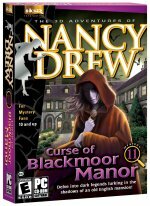 While several of the earlier Nancy Drew software titles were enjoyed by children as young as 10, Curse of Blackmoor Manor is best for teens 13 and up because it’s a little scarier, its puzzles are harder, and its themes of witchcraft, lycanthropy, and alchemy make it more appropriate for older children. Because the puzzles in this title are so challenging, you may want to invest in the “Strategy Guide”—a book full of hints—which is available at www.herinteractive.com for $9.99. Even testers playing on the easier “Junior Level” found this reference to come in handy.